1. Jamie works as an adventure guide, but her experiences in Bali left her with panic attacks and a fear of crowds. If you were Jamie, would you have been able to go back to Bali? Have you ever had to return to the scene of some difficulty in your life? 2. What do you think helped Jamie more—-coming back to the site of her trauma for healing or searching for the man who helped save her life? 3. Jamie gives Bambang a chance even after the wallet–stealing incident. What does that say about Jamie? 4. Nyoman tells Jamie, “I will be your Ganesh,” referring to the statue in his garden of the Hindu deity with the head of an elephant, who is said to protect his believers from demons. In what ways did Nyoman protect Jamie? 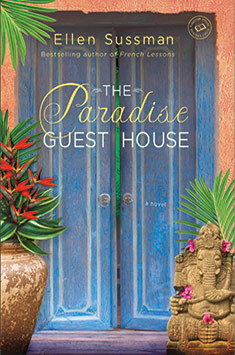 And how did her presence at the Paradise Guest House change him? 5. Jamie sees her boss, Larson, as a father figure of sorts. What does she see in him that she doesn’t see in her biological father? 6. What did you make of Jamie’s rejection of Miguel’s proposal? 7. How might Jamie and Gabe’s shared experiences in the bombing have changed their feelings for each other? Do you think they would have felt the same way if they had met under different circumstances? Do you think that a relationship that is created during a traumatic event might have a deeper bond? 8. Do you see Gabe’s time in Bali as his way of running from what happened in Boston with his son, Ethan, or as his running to something unknown and new? Or both? 9. How did Gabe’s response to the bombing differ from Jamie’s? How did it differ from that of the residents of Bali? 10. What did you think of the structure of the book? How did the alternating sections from 2002 and 2003 work to advance the narrative in unusual or unexpected ways? 11. There are many themes in this novel—-love, healing, second chances. What struck you as the most important theme? What do you think was ultimately the book’s lesson? 12. What do you imagine happens after the end of the novel?